Students enjoy a sunny day by the Niles Trammel L.R.C. Building (Building 2) in 2016 (L) and 1971 (R). On September 6, 1960, a community experiment in education was officially launched. 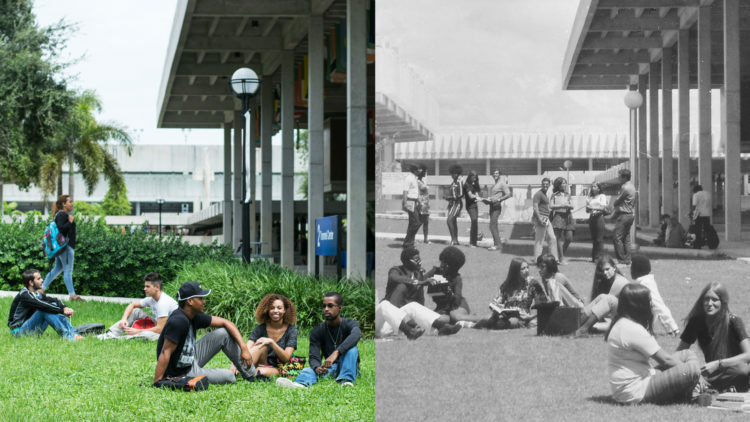 Dade County Junior College, as MDC was then known, arrived at a time of transition for Miami, a city that was struggling to cope with desegregation and a massive influx of Cuban refugees, two forces that would reshape the cultural and economic identity of the area. A facility was built on an old naval air station near Opa-locka Airport (known as Amelia Earhart field), which would soon become the College’s North Campus. Admission was open to any high school graduate in Miami Dade County. The first class consisted of 1,428 students, including many Cuban refugees and seven black students making Dade Junior College the first integrated junior college in Florida. To this day, MDC remains one of the most diverse and well-integrated institutions in the country. Just a few years after its opening, the college leadership was already thinking long-term, with plans for a second campus in Kendall and perhaps even a third one in Downtown Miami. MDC now stretches over eight campuses and has the largest undergraduate enrollment of any college or university in the United States. In 2006, MDC reached an important milestone, welcoming it’s 1.5 millionth student, a remarkable achievement in a community with 2.3 million residents. The College now offers over 300 programs and educational pathways along with six degree options, including a Bachelor’s. The 2015-16 academic year welcomed 161,632 registered students. To commemorate its beginnings and affirm its expanding role in the community, MDC is inviting everyone to join in the inaugural celebration of I AM MDC Day, on September 6, 2016. Looking ahead, I AM MDC Day will be celebrated annually as a way for members of the community to come together and take pride in their school, share their stories and help pave the way for others to follow in their academic footsteps. The virtual event is a 24 hour social media shout out that calls on the MDC community to share their stories, tweets, images and videos about what I AM MDC means to them, and to contribute to funds that financially assist deserving students. Though most of his friends dropped out eventually, Salas stuck with it. “I stayed in with a lot of pride,” said Salas. “I started getting good grades and was awarded a scholarship aimed at supporting Latino men. I remember going to school, driving down Flagler, and going past the street corner where my friends were still hanging out, thinking, that could be me, but I’m going places instead.” After MDC he continued his education, becoming a certified public accountant and taking on increasing responsibility in high-level positions with different companies, including Burger King Corporation. Today, Salas owns every Pizza Hut franchise in South Florida and serves on the board of the MDC Foundation. Margaret Brisbane enrolled at MDC when she was 17 years old. She was a new arrival from Jamaica, and came from a family where getting a good education was expected. Eager to get going, she enrolled right away. Brisbane describes her time at MDC as a fun experience that was easy to navigate. Before long and with the support of others on campus, she felt at home as part of a community of people with similar backgrounds. Brisbane’s early preparation at MDC served her well, allowing her to continue with her studies and apply her skills to a number of different situations. After MDC, she earned a Bachelor’s in International Marketing from FIU and then an MBA from Nova University. She started her professional work experience in retail then moved on to banking and eventually settled into technology management. Today she oversees applications development for Miami Dade County. As Assistant Director for the Information Technology Department, Brisbane reports to the Chief Information Officer and leads initiatives that support all 26 departments within the county, which run the gamut from financial payroll systems to legislative, criminal justice, ports and parks. She describes her charge as a very diverse portfolio that supports citizens as well as Miami Dade County employees. Brisbane adds, “If you want to support MDC, in addition to donating to its programs, I think it’s important to ask yourself, what can I do to help move the needle forward? How can I be of use in aligning the educational role of the College with the business needs of the community? Want to Give Back and Help MDC? You can make a donation that helps sustain and expand the growth of MDC’s programs and its role in the community. Donations of any amount are welcome. To give $10 text MDCFUND to 501501.